I recall watching a Buccos -Phillies game probably the year this card came out in ’75. It was pouring rain, Pirates were winning and was top of the fifth. With two outs, Kirkpatrick came up and before the first pitch was thrown began (and continued) to step out of the batter’s box and call the batboy over to give him a towel to dry the handle of the bat off. This antic continued after every pitch which seemed to be a twenty pitch at bat at the time. The Philly announcers, Ashburn and Kalas, were absolutely amazed he would stall like that when the Pirates had a good lead and the Phils still had to bat in the bottom of the ining in a game that was about to be called any minute. Had not all the Philly fans run for cover, Kirkpatrick would surely have been inundated in boos. Kalas somehow incorporated Kirkpatrick had about six kids or so into the at-bat, as if that would appease the impatient Philly fans who had other ideas what Ed could do with his bat. Still amazed I recall these snippets vividly from my early teen years, yet can’t remember my debit card PIN! BTW, Josh – just received Baseball Fantography per your recommendation and look forward to reading it…. Thanks for sharing that memory. I like Kirkpatrick even more somehow. The baseball fan-teacher-little kid in me really enjoyed this post. Thank you Josh! Funny that the two cards I have of him in my collection have him listed as a catcher only (Royals) and of-1b (1978 with Brewers). Can clearly trace his career arc. Good post. That’s really quite a wonderful post. 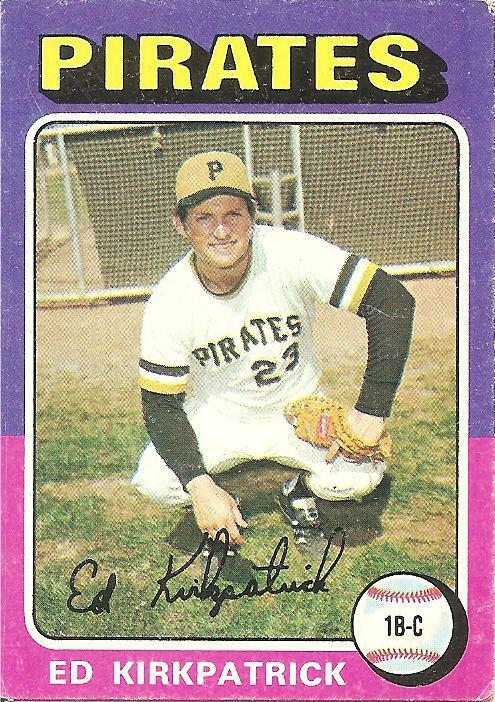 I will forever remember Ed Kirkpatrick’s 1976 card. For it was the one card that escaped my 9 year old grasp, which would allow me to complete my set for this season. I grew up on a street with roughly 12 neighborhood boys of varying ages. We were always in competition to be the first to complete our baseball card set for the year. We did trade cards but tended to discard or hide duplicates if a rival friend needed it. Cruel, yet competitive for sure. I will remember this card even more for the graciousness of my best friend Mark. We were ultra-competitive, but always best friends. He needed about 10 cards to complete his set, yet he was kind enough to give me his one and only, 1976 Ed Kirkpatrick card. If I remember correctly, Ed had a big smile on his face on this card too, as did I after receiving this gift from a friend. I had not talked to my friend Mark in 3 or 4 years until I saw this post. When I called him, the first words out of my mouth were “Thank You”. And thank you Mr. Wilker, for this wonderful world of Cardboard Gods. Thanks for that story, Mike!